We adapted this rich and hearty soup recipe from Oh She Glows Everyday, which is a wonderful resource for delicious plant-based recipes. 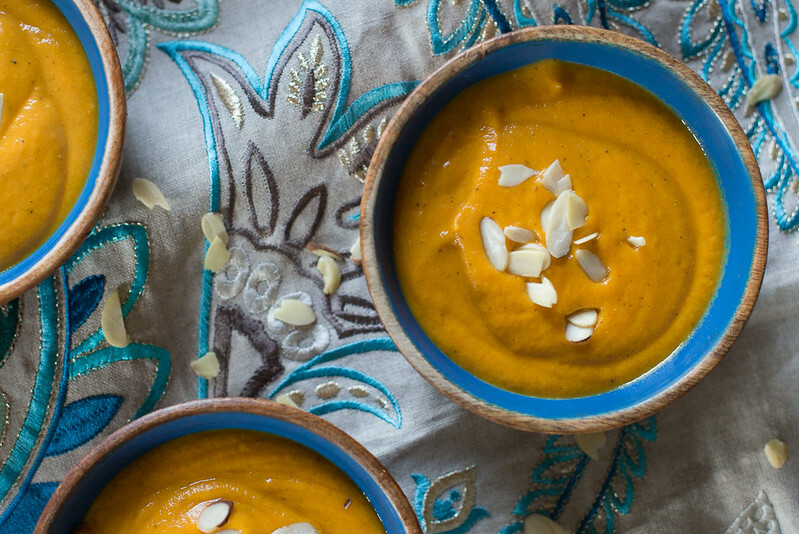 The curry paste gives this blended soup a Thai inspiration and we added coconut milk to thin it a bit while adding extra creaminess. In a large soup pot, melt coconut oil over medium heat. Add onion, garlic, and ginger and saute for 5 minutes until onion is translucent. Stir in curry paste. In a small bowl, whisk almond butter with some broth until smooth. Add to pot, along with the rest of the broth, carrots, sweet potatoes, salt, and optional cayenne pepper. Stir and bring soup to a low boil over medium-high heat, then reduce heat to low. Cover soup pot and simmer for 20-30 minutes, until potatoes and carrots are fork tender. With an immersion blender, blend soup in the pot until smooth. If you have a regular blender, carefully blend soup in small batches, making sure to leave the lid ajar for steam to escape. Return all blended soup to the pot, over low heat, and stir in coconut milk. Add salt and pepper to taste. Soup can be served with fresh cilantro, almonds, and a squeeze of lime juice. This is a naturally smooth texture so it's perfect to introduce FLAVOR to brand new eaters. If your baby has already eaten nut products without any problems then this is a nice way to also keep nuts in the diet. If you enjoy more spice, add more curry paste after you take out a portion for baby. Babies crave flavor and this recipe will not disappoint!